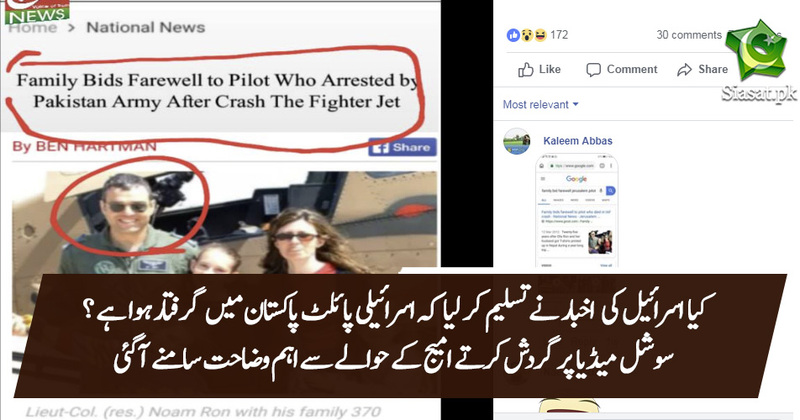 An image shared thousands of times on Facebook purports to show a Jerusalem-based newspaper reporting the arrest of an Israeli pilot in Pakistan. The claim is false; the photo in the post shows an Israeli Air Force pilot who died in a helicopter crash six years ago. Multiple Facebook posts, for example this one published on March 10, 2019, and shared more than 2,000 times since, contain what appears to be a screenshot of an article by Israeli newspaper the Jerusalem Post. In the purported screenshot there is a photo of a man in military uniform standing with his family next to a plane. The same image was shared hundreds of times elsewhere on Facebook, for example here and here. The screenshot is a doctored copy of this Jerusalem Post article published on March 12, 2013, which contains the same photograph of the man and his family. Yar eik hai shauq hai becharaye ka! Uspay bhi duniya jeene nai daiti skheikho ko! pak had the other pilot stay rest assured but his identity was not revealed, but most probably he was from Israel. Now this is the great mystery. The ISPR first claimed about capture of a second pilot (in fact three pilots in total) and have never retracted from that statement ever since, but instead they have decided to remain quiet. There appears to be something fishy here.